Sting might be the best looking male in his age group, according to much of the female portion of his loyal audience Tuesday night. Happily, judging from a beautifully paced and immaculately performed show kicking off the Artpark summer concert season, he doesn't need to rely on that fact. His occasional shimmies might draw screams from some of his fans, but it is clearly the prowess of his songwriting and the high level of musicianship evidenced by his band that speaks the loudest. Fronting a smaller ensemble than he has often since the breakup of the Police - longtime guitarist Dominic Miller, drummer extraordinaire Vinnie Colaiuta, former E Street keyboardist David Sancious, violinist David Tickell, and backing vocalist Jo Lawry - Sting took us on a tour through his impressive catalog of songs. He did indeed play a handful of Police songs - an early-in-the-set 'Everything She Does Is Magic' was one of the night's highlights, as was a burning rendition of 'Demolition Man' - but much of the set drew from the albums 'Ten Summoner's Tales' and 'Mercury Falling'. It was a hits-centered set, but one that offered consistent surprises in terms of both set list choices and musical arrangements. After opening with a bright, confident 'All This Time', Sting, whose rock-solid bass playing was the conductor's baton that directed the band throughout, began to allow each of the incredible musicians he'd assembled stretch out a bit. Drummer Colaiuta melded a jazz approach to the frantic high-hat style made famous by Sting's former partner in the Police, drummer Stewart Copeland, and his playing during a torrid take on 'Driven To Tears' was simply stunning. He's one of the finest drummers extant, and he proved it throughout Tuesday's show, without ever distracting from the momentum and pacing of the songs themselves. Violinist Tickell took over the saxophone parts initially made famous by Branford Marsalis during 'Englishman In New York', and 'Demolition Man' afforded guitarist Miller and keyboardist Sancious an opportunity for some call and response at the tune's coda. Miller and Sting displayed a long-held musical telepathy during gorgeous takes on 'Fields Of Gold' and 'Shape of My Heart', with Miller playing masterful classical guitar during both. Singer Lawry shadowed Sting in perfect harmony throughout, sounding particularly powerful during a beautiful new arrangement of the prog-folk tune 'The End of the Game'. Sting told the crowd of his ongoing love for country music a number of times during the evening, taking time to note his gratitude upon first hearing Johnny Cash's version of Sting's haunting 'I Hung My Head'. He then led the band through a brilliantly rearranged version of that song, with the surprising addition of a 5/4 time signature that suggested reinvention of a much-loved song. The show, clocking in at two hours, was close to flawless. Minor quibbles? Really, just one. It would've been nice to hear these fantastic musicians stretch out even more than they did. 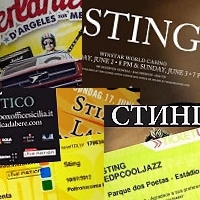 All are musicians of the highest caliber - Sting included. His bass playing is often overlooked, probably due to the strength of his singing and songwriting. But it shouldn't be. He, like every musician on Artpark's stage on Tuesday, is simply a beast of a musician. Beautiful renditions of encores 'Desert Rose' - even if Sting was a touch hoarse by song's end - and 'King Of Pain' drove this point home. I live in S. Jersey but have family in Buffalo, NY. I decided to travel to Buffalo and take my 19 year old niece with me to the Artpark to see Sting. It was the best concert I have ever been to. I saw Sting with Police in Phila. a couple of years ago because I did not think I would ever be able to see him by himself. What a great venue, wonderful music. If I had a bucket list, this would have been on top. Thank you for a wonderful memory. Traveled from Canada to the States to see my boy play haven't missed a tour since 1983. Awesome night at the park! Saw the show in Toronto at Massey Hall back in November and loved it. Tuesday night was almost perfect, I was looking forward to the acoustic version of Message in a Bottle to end the night, but it's always good to hear it live however Sting performs it. Great sound, nice venue, Sting shines! Great show, with the crowd loving Message in a Bottle and Desert Rose, especially. Sting has revealed to us on this tour his songwriting process (making songs like "Ghost Story" much more meaningful to me now), yet he hasn't released a new album in a long time. The play he is developing seems to go over some of the same territory covered in Soul Cages. I would love if he wrote a new album with songs written specifically for artists he has worked with over his career, for example a soulful fiddle song with Peter Tickell, something jazzy with Branford, an acapella tune with Jo Lawry and Dollette Mc...Imagine the liner notes outlining how the fellow musician inspired the song writing and the content! Plus, he's got to play "Money for Nothing" on this tour...with Tickell playing the Knopfler part! I'd go a third time just for that!